Mr. Abubakar Malami, the Attorney-General of the Federation and Minister of Justice, has said the government of Switzerland is set to return in tranches the sum of $321m stolen from Nigeria and stashed in the foreign nation by the late former Head of State, Gen. Sani Abacha, and his family, Punch Metro reports. A statement by the AGF’s Special Adviser on Media and Publicity, Mr. Salihu Isah, stated on Tuesday that this followed a tripartite Memorandum of Understanding signed by Nigeria along with Switzerland and the World Bank in the United States of America on Monday. According to Isah, Malami, on behalf of Nigeria, signed the MoU alongside representatives of Switzerland and World Bank at the ongoing Global Forum on Asset Recovery in the US. Isah said the Director of the Directorate of International Law and head of the Swiss delegation to the GFAR, Roberto Balzaretti, signed the MoU on behalf of the government of Switzerland and the Country Director of the World Bank office in Abuja, Mr. Rachid Benmessaoud signed on behalf the World Bank. He explained that the MoU spelt out the modalities of returning the sum of $321m by Switzerland to Nigeria. He said, the funds would be returned to Nigeria in tranches under a project known as “the National Social Investment Program” aimed at strengthening social security for the poor in Nigeria. He stated, “The MOU stipulates that the restitution of funds will take place within the framework of a project known as the National Social Investment Program that will strengthen social security for the poor in Nigeria. “The MOU also regulates the disbursement of restituted funds in tranches and sets out concrete measures to be taken in the event of misuse or corruption. “The chosen solution for restitution is being undertaken by the three contracting parties as a partnership” in line with the objectives of Switzerland’s strategy to freeze, confiscate and return the illicitly acquired assets of politically exposed persons (asset recovery) which is based on the principles of transparency and accountability. 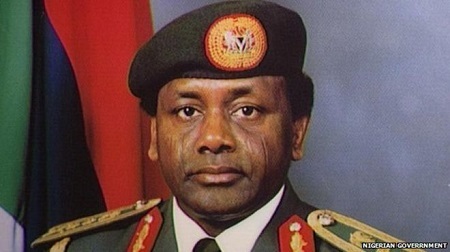 He explained that that the sum of $321m was initially frozen in Luxembourg and confiscated by Switzerland as part of criminal proceedings brought by the public prosecutor’s office of Geneva against Abba Abacha in December 2014. The statement added, “The signing of this MoU gives Nigeria visibility and will set precedence on the need for transparent management of returned assets internationally. “The GFAR brought together experts from the field of asset recovery to strengthen international cooperation in this area. According to Isah, the Nigeria’s delegation to the meeting was led by Malami. The members of the delegation the Special Assistant to the President on Justice Reform and Coordinator, Open Government Partnership comprised Mrs. Juliet Ibekaku-Nwagwu; Nigeria/GFAR Focal Person and Assistant Director, Federal Ministry of Justice, Mrs. Ladidi Abdulkadir; a representative of the civil society organisations, Reverend David Ugolor, who is also the Executive Director, African Network for Environment and Economic Justice. The delegation is expected to return to Nigeria Thursday.